The capital of Yunnan Province is home to over 6 million people and is arguably the most village-like big city in China. Its relatively high altitude (just on 1,900m) and longitude (just north of the Tropic of Cancer ) grants it a phenomenally temperate year-round climate. Smog here is not a major issue either, making Kunming one of the most enjoyable Chinese cities in which to spend a few days. Spread over a large distance and not overrun with vertiginous skyscrapers, Kunming boasts plenty of natural, cultural and historical sights, making it a truly great all-rounder. Visit Kunming for a few days of relaxing city-escape, or as a springboard to explore the further reaches of the naturally blessed Yunnan Province. Kunming was one of the most important stops along the southern caravan route of the Ancient Silk Road and facilitated trade and transport into Tibet, India, and Myanmar. Its rich history dates back over 2,400 years although fossil discovery dates human civilization here to more than 30,000 years ago, during the Palaeolithic Age. Nearby Dian Lake is what first attracted migrants to this area about 7,000 years ago, when they set about establishing agricultural settlements. The rice paddies around Kunming are said to be the oldest in China. Modern-day Kunming, as a trading hub, was settled in the 8th century AD and, shortly thereafter, was incorporated into the Kingdom of Dali , making this one of the most ancient capitals in China. The city went through several name changes as it passed hands through various dynasties and suffered several raids and was plundered throughout its tumultuous history. To add to its woes, it was also challenged in the late 1800s by the French Empire, which sought control over the area so as to exploit its mineral resources. The city’s superb geographical position has always been a double-edged sword, and by 1908 Kunming was positively set to become one of the most important international trading ports, connecting Asia with the rest of the world. After enduring further invasions during both World Wars, Kunming was finally liberated in 1949 and its newfound freedoms allowed it a chance to grow and prosper as a significant industrial city. You’ll find plenty of interesting landmarks both in and around Kunming. Although the city is widespread, it boasts a great public transport system and a wonderfully relaxing vibe. This is a rare find in China! These are just some of the city’s most prominent highlights. Kunming is home to many, many temples, yet if you’ve the time or the inclination to visit only one, then make sure it is Yuantong. The oldest and most important Buddhist Temple in Yunnan, Yuantong is a haven of tranquility amongst the chaos of the city’s bustling center. With lily and turtle filled ponds, an abundance of colorful flowers and superbly decorated halls and pagodas, Yuantong makes for a brilliant intro into the city’s more spiritual side. There are numerous shaded spots to stop and rest, a lovely vegetarian restaurant serving delicious spinach dumplings and, if you’re lucky enough, you’ll also see a ceremony taking place. The temple is popular enough, yet mainly with local tourists, giving it a distinctly less-than-touristy feel. Within walking distance to Yuangtong Temple is where you’ll find Green Lake, Kunming’s most beautiful urban park. Here, you’ll find colorful pagodas, lakes, cafés, restaurants, and even a square where locals descend to in the late afternoon to take part in the ubiquitous dance-offs for which China is so renowned. Visit at any time of day and you’ll see street performers, concerts, souvenir stalls, and all sorts of happenings here. A lively and fun place in which to spend a few hours, all the while admiring the impressive high-rise skyline of the city center. Often described as the cultural-Disneyland of China, this utterly bizarre complex aims to introduce visitors to Yunnan’s multi-ethnic inhabitants. The Village can easily be described as a human-zoo-like attraction, with replicas of minority villages set up in an extensive area, each duplicating the ‘natural environment’ of the specific tribe. No matter how weird this place may sound, trust that it is an excellent place to visit, where you can get a taste of all the ethnic minorities which comprise this outstanding province. Yunnan Nationalities Village is located just west of the Lake View Golf Club. Westerners may find this market a little hard to digest, yet the abundance of puppies, kittens, turtles, and a near-infinite array of other animals on sale, make for a totally unique sight. Funnily enough, flowers and birds are the least of what you’ll find here, with fluffy animal, art and craft stalls making up the majority of the sellers. Aside the shopping opportunity, you’ll also get the chance to explore the oldest part of Kunming, where still-crumbling old shop-houses have yet to be demolished and rebuilt. Nanping is the commercial hub of Kunming and a wonderful pedestrian street to explore at length. You’ll find an abundance of shopping malls, restaurants, and cafés here to keep you entertained for days on end. For the best and most authentic finds, head off into the little alleyways which cross Nanping, where you’ll find traditional shops selling handmade wares of all sorts. Once you’ve spent a couple of days admiring the sights in Kunming, plan to spend a few more days days exploring the city’s natural surroundings. 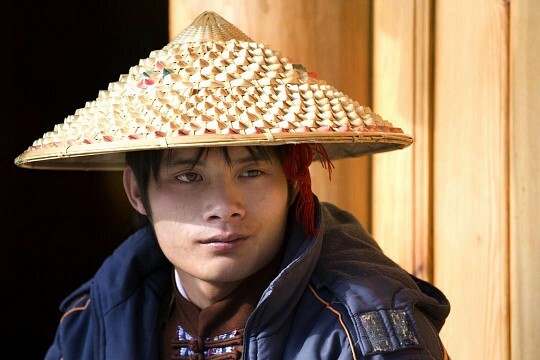 Yunnan is known as the most beautiful of all of China's provinces, home to more natural wonders than any other. Kunming is the ideal base from which to explore the province. 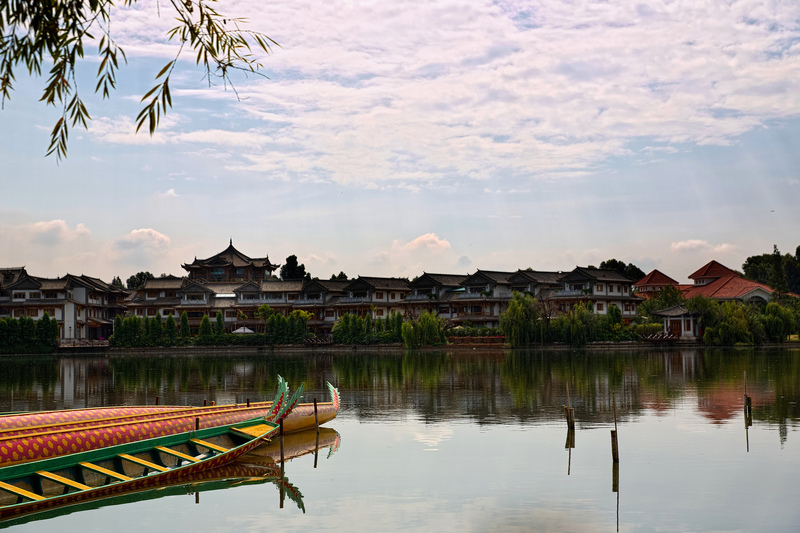 Jutting out from Kunming’s southern perimeter, Dian Lake is a favored weekend retreat destination for city dwellers and is the largest lake in Yunnan. It sits at an altitude of 1,887m and, although it is known as ‘the sparkling pearl embedded in the highlands’, it is not, by far, the cleanest lake in the country. Up until 1990, Kunming’s waste water was dumped in the lake untreated and even though much effort has been poured into restoring the delicate balance of nature, the lake still has a long way to go. You may not want to head here for a swim, that’s granted, yet the lake boasts some truly beautiful spots to either admire the scenery of nearby mountains, or as a springboard to enjoy some grueling hikes. The enormous seagull population acts as a magnet for locals on weekends, and a fun chair-lift attraction allows you to take in the views of the lake, mountain, and city, in a very civilized way. 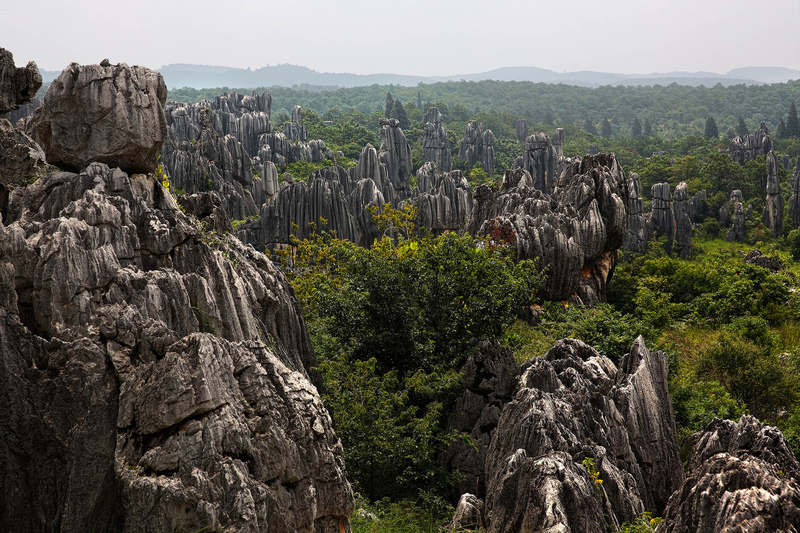 Yunnan’s amazing Stone Forest is about 120kms south of Kunming, and arguably the most impressive day-trip destinations of all. 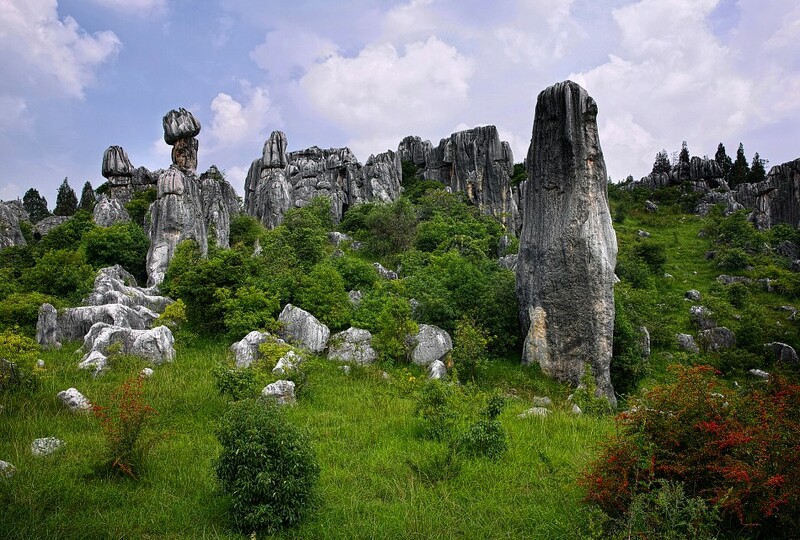 The 400 square kilometer natural reserve is home to incredible karst rock formations, known as ‘stone forests’ and provide hours of blissful walking and hiking. The forest was submerged about 240 million years ago, and the subsequent change in topography, and relentless erosions, have created an otherworldly landscape. The Dongchuan District is home to one of China’s most iconic sights: endless expanses of immensely colorful terraced fields. Found about 250km north of Kunming, the Dongchuan Red Land, as it is more commonly known, is often dubbed ‘Mother Nature’s most colorful palette’ and is one of Yunnan’s most unmissable sights. This less commercialized region is an absolute treasure and, although staying at least one night is recommended, in order to enjoy the scene at sunset or sunrise, visiting on a day trip is also possible. Thanks to Kunming being primarily a business center, you’ll find hotels in every corner of town. If you’re travelling on a tight budget, you may want to hone in on the area around the railway station. Self-serviced apartments are popular among Chinese travelers and are surprisingly affordable. Like all of China's cities, every street in Kunming abounds with local eateries, yet unlike some others, the city also boasts quite a few Western-style restaurants, bakeries, and cafés. Nanping Road is home to a wide range of upmarket restaurants and fast-food joints selling burgers and kebabs, which seem to be insanely popular with young locals. For a truly great meal, however, head to the northern edge of Green Lake (Wenlin St) as it is here that you'll find the best and trendiest joints in town. French Café is a gorgeous little place serving wonderful coffee and very authentic pastries. You can savor filled baguettes served on dark rye bread, a rarity in this part of the world. Just a few doors down and around the corner (to the west) is where you'll find Salvadors, a meeting place for expat students who relish in the (relatively) cheap but mouthwatering cocktails and bar food. The outdoor high bar is a great place for people-watching! For a refreshing pint and amazing pub grub, head to O'Reilly's Irish Pub, on the Beichen pedestrian street, the most favored expat hub in Kunming. Nearby Cacao serves up THE best Mexican food you could ever hope to find anywhere in Asia. Kunming is not known as ‘Spring City’ for no reason, and although winters here seem to be getting older as time passes, the city does have quite fab weather all year long. Due to the altitude, the intense summer heat, which is almost unbearable in other parts of the city, is blissfully absent. Although the city can certainly be enjoyed even in winter, travelling between March and October will be by far the most recommended option. Not only will you see flowers in full bloom, but you’ll also have the chance to attend the city’s numerous festivals, which are put on hold during the coldest months of November to February. Changshui International Airport is the primary entry point of the Yunnan Province and found 25km out of the city center. A brand new bus service links the airport to the city’s East Bus Station, from where connections can be found to just about every corner of Kunming.